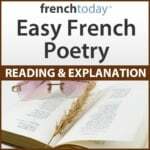 Today, I’m going to read the poem Sonnet 24 by Louise Labé, the first recognized French poetess. She was born in Lyon, between 1520 and 1525. She was raised during one of the most interesting centuries in literature’s history. The Middle Ages were over, and the Italian renaissance was creating a revolution in France’s artistic life. The message of the poem is simple and still so very modern: love and its torments…I will read the poem once slowly so you can repeat after me, then I’ll read it faster with a personal interpretation. Las que mon nom n’en soit par vous blamé. Et plus d’estrange et forte passion. Et gardez vous d’estre plus malheureuses. Las ! que mon nom n’en soit par vous blamé. Et gardez-vous d’être plus malheureuses! [adblock]Then, ladies, do not denigrate my name. Don’t file their needles to a point. But 0 take care your suffering’s not worse.